I am about to embark on another Antarctic Expedition with the International Ocean Discovery Program (IODP)! This is the first time that the drillship JOIDES Resolution will be visiting the Amundsen Sea Embayment of Antarctica. No ship has ever drilled deep into the seabed in this area. Hence we know very little about its history. The Amundsen Sea today is the focal point of ice discharge from West Antarctica into the ocean. 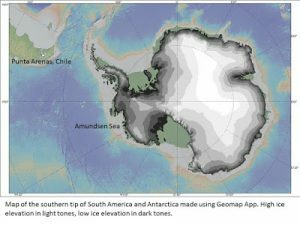 An area roughly the size of California in West Antarctica is losing ice at an accelerating pace. Scientists are questioning whether this is a response to recent warming of the oceans and would like to know if there is a point of no return beyond which ice can be lost permanently or for a very long time. Two IODP expeditions, one to the Ross Sea (Exp. 374) and the current one to the Amundsen Sea (Exp. 379) are addressing this question. By drilling into the sea bed, geologists can access deeper layers that date from before the last ice age and find out how the ice sheet behaved under warmer climate conditions in the past. In fact, today’s developments are like an incomplete movie: we cannot yet see the end of the ice-sheet change. By going into the geological archive of past climate changes embedded below the sea floor we can reconstruct the full cycles of ice growth and melt from beginning to end over hundreds to thousands of years. Such a complete story of ice-sheet change will give us information on whether its current behavior is outside the normal range, and will help predict how the ice sheet may behave in the future. I will be leaving for the port city of Punta Arenas, Chile next week. I am currently packing and getting ready for a 2-month stay on a drillship without an opportunity to get off! See you soon.